Special thank you to Oriental Trading Co. for the gifted balance set. As always all thoughts and opinions are 100% my own. Happy Tuesday friends! I got some requests for science on my Teach Tuesday posts so here we go! 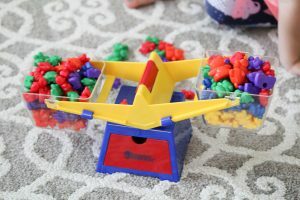 Today I want to share weighing counting bears and some different things you can do with this set and how it can be beneficial to your child developmentally. You can find this set on Oriental Trading on their Learn365 site. This durable Learning Resources Baby Bear™ Balance Set is great for STEM activities. STEM stands for Science, Technology, Engineering and Math. I love how the colorful bears make comprehending mass measurement more fun and playful. The set is simple and fun for little hands. The clear buckets are easy to remove and the while set I plastic, so easy to wipe down. For older children (3+ years) you can work on estimation skills due to the clear buckets. Grab a handful of bears and place them in one side. Then count out 20 bears and put them in the other side. Ask your child to look at the scale. Which side is down? The side with the 20 bears or the amount that is unknown. Say it’s the side with the 20 bears. You can help them think through this. If the 20 bears weigh more, than the number we guess for the other side has to be less than 20. I love that there are covers for the buckets, so if you decide to weigh liquids or liquid vs ice you can cover the buckets to prevent spillage. For younger children (2-3 years) you can work on counting skills and introduce the concept of weight. Some objects weigh more than others. A higher amount of bears weighs more than a smaller amount. 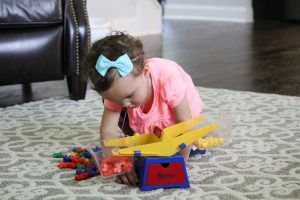 Beyond this you can also work on sorting skills which is an early math skill. For example: Ask your child to put all the blue bears on one side. I hope I introduced you to something new and fun! Enjoy exploring with your littles! Find more education goodies at Oriental Trading learn 365. Great intro to STEM concepts! I love this! And that toy is great! This is freaking awesome! I need it for MG! This is such a fun activity for kids – mine would love this! We love our counting bears! We use them so often, almost daily. 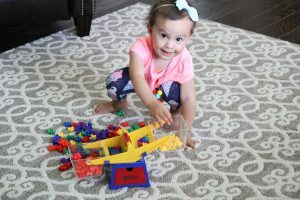 They are such a versatile “toy” Great post! What an awesome toy this is! 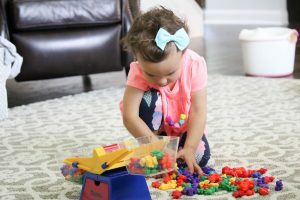 It really looks like she is having the best time learning and playing! These posts are so awesome mama! My kids would love this activity! I love that! And I love anything that makes learning fun! How cute is this! We need some new activities for the kids. Love this activity! You always share creative ideas!